Sergei Lukyanenko’s spellbinding tales of magic in post-Soviet Moscow have been attracting readers for fourteen years. Long before Stephanie Meyer’s “Twilight” series and less than a year after the first Harry Potter book, Sergei Lukyanenko conjured up a uniquely Russian supernatural world. The first novel in Lukyanenko’s “Night Watch” series was published in 1998, becoming a bestseller, a cult movie and a magnet for magic fans. Witches, warlocks and werewolves, sorceresses, succubi and yes, vampires, inhabit a gloomy Muscovite world with a distinctive atmosphere. Anton, the novel’s hero, is a Light Mage in the Night Watch who patrols the activities of Dark Others (capitalization is a big feature of Lukyanenko’s prose). While riding the Moscow metro in search of vampires, he notices a dark spinning vortex above the head of a pretty, young woman in a “stylish fur coat.” Lukyanenko’s skill is to weave supernatural imagery into a recognizable landscape. One minute, the characters are passing McDonalds, factory canteens or the TV tower at Ostankino and the next minute, one of them is drawing a Book of Destiny with fiery threads, extracted from “the deepest levels of the Twilight.” It is a powerful combination that has sold millions of copies worldwide, won dozens of awards and created a committed international fan-base. The fourth book in the series, “The Last Watch” (set in Scotland), was published in English in 2009 and the news is that Lukyanenko has just delivered a fifth book, “The New Watch,” to his Russian publishers. Lukyanenko was born in Kazakhstan in 1968. He trained at the National Medical Institute in Almaty (then Alma-Ata), but a poorly paid job as a child psychiatrist was less appealing than trying his luck as a novelist. He started writing science fiction as a student and gradually began to make money from his stories and novels, editing a sci-fi journal in the early 1990s and moving to Moscow in 1996. 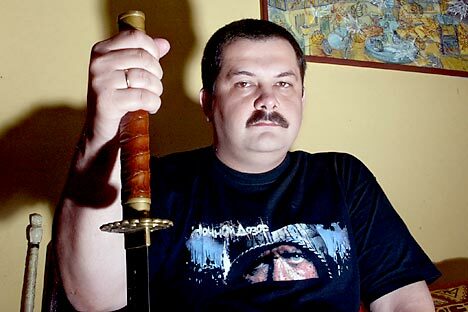 The publication of “Night Watch” was a breakthrough, but it was the 2004 movie adaptation that really made Lukyanenko the Russian literary celebrity he is today. The film broke records in the emerging post-Soviet film industry and was so successful that Hollywood bought up the rights to the third installment. Director Timur Bekmambetov said in a 2005 interview with the BBC: “Night Watch is a very Russian movie. It's impossible to imagine this kind of movie somewhere else: a movie with a depressing ending, a lot of inexplicable storylines and strange characters.” Bekmambetov started out making commercials, and claims the variety of techniques he learned in that trade was invaluable in making this box-office hit. He also credits the American film director and producer, Roger Corman, for teaching him “a lot of secrets in making movies look bigger than their budget.” Corman, who shot “Little Shop of Horrors” in a few days, is best known for his Edgar Allen Poe film series starring Vincent Price. So far, the Night Watch series are the only books by Lukyanenko available in English translation, but he has written scores of other novels and short stories. His early science fiction for children also prefigured recent trends in young adult literature. His 1990 novel, “Knights of Forty Islands” has a similar plot to Suzanne Collins’s hugely successful novel, “The Hunger Games” (2008), now a box-office-busting movie. In Lukyanenko’s novel, a group of teenage children are similarly locked into a controlled scenario (in this case involving the forty islands of the title), where they have to fight to the death. Only the winner, who has conquered all the islands, can go home. Mikhail Bulgakov’s famous tale of diabolical mayhem in Moscow surely influenced Lukyanenko - especially in “Cold Shores,” which, like Bulgakov’s “Master and Margarita,” describes an alternative version of the life of Christ, in which Jesus dies in infancy. American authors like sci-fi veteran Robert Heinlein and master of horror Stephen King also influenced Lukyanenko’s edgy brand of fantasy. In November last year, Nicholas Seeley wrote in the magazine “Strange Horizons” about the 1990s shift in fantasy genres “away from sword and sorcery, and toward stories with modern or futuristic urban settings.” Explaining that it was more than just a change of scene, “it was a shift toward greater moral complexity.” Seeley described Lukyanenko’s novels as “seminal works in the rise of urban fantasy” and asked the author more about his ideas. “What draws me to science fiction is mystery. The possibility of What if…,” Lukyanenko told him.